This is an excerpt from a story delivered exclusively to Business Insider Intelligence Apps and Platforms Premium subscribers. US mobile carriers are racing to invest in the next big thing in wireless — 5G — but the lack of user understanding of the standard will prevent carriers from reaping the benefits of their new network technology. Over four-fifths (81%) of consumers don’t have an understanding of 5G or what it means for the future, according to a survey by PCMag.com. This indicates that US wireless carriers aren’t doing enough to educate their subscribers about the new network technology, meaning that once 5G does become generally available, customers will have no incentive to upgrade their service plans. This lack of understanding is a major problem for US wireless carriers because it will hinder their ability to tap the $300 billion annual revenue opportunity for 5G connections by 2025. This problem is even more substantial when counting the misinformed customers who believe they already have access to 5G. 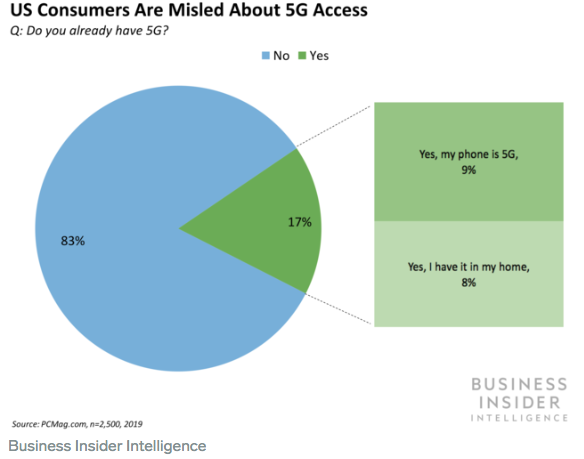 When asked whether they already had access to 5G, 17% of respondents said yes, with 9% believing their phones support 5G and 8% believing they have it in their homes. And a quarter of the 19% of consumers who said they have an understanding of 5G and what it means for the future said they already have access to it. Because these consumers believe they already have 5G, we don’t expect them to upgrade their service plans when the network technology becomes available. The confusion is likely partially driven by terms including “5G Evolution” and “5GHz Wi-Fi.” 5G Evolution, or 5G E, is a term that’s been propagated by AT&T, which recently came under fire from Sprint, Verizon, and T-Mobile for falsely marketing phones as 5G capable after it replaced the 4G LTE label on its devices with a “deceptive” 5G E label. The 5G E label indicates that a device is capable of supporting its existing 4G LTE network with advanced technologies, like carrier aggregation and 4×4 MIMO, which offer faster data speeds but are still well below the speeds of true 5G. Meanwhile, “5GHz Wi-Fi” is an established short range Wi-Fi frequency band that was introduced nearly a decade ago — but it’s not true 5G. Carriers must clearly communicate how the technological advancements of 5G over the current standard, 4G, will improve their customers’ mobile experience.5G data speeds are much faster than 4G: 5G’s peak data rate, 10 Gbps, is 10 times faster than 4G’s, which is just 1 Gbps. Meanwhile, 5G’s latency — the delay of data transfer — is significantly slower, at less than 1 ms on 5G and 10 ms on 4G. While these improvements are sure to be significant to someone in the industry, they probably don’t mean much to the average consumer. But, if US wireless carriers could paint a picture of how the technological advancements of 5G will impact their customers’ lives in a way that resonates — such as revealing that the average 5G user will save nearly a full day each month from faster streaming and downloads on movies, TV, music, gaming, and social media — it will better enable them to convince consumers to make the leap to 5G. They need to showcase how the benefits of 5G will open up new experiences.International carriers are planning their 5G network rollouts in conjunction with major sporting events: Over one-third (37%) of global operators are planning their commercial 5G launches with top sports events, such as next summer’s Olympic Games in Tokyo or the Euro 2020 soccer tournament. This share jumps to 81% for APAC operators. 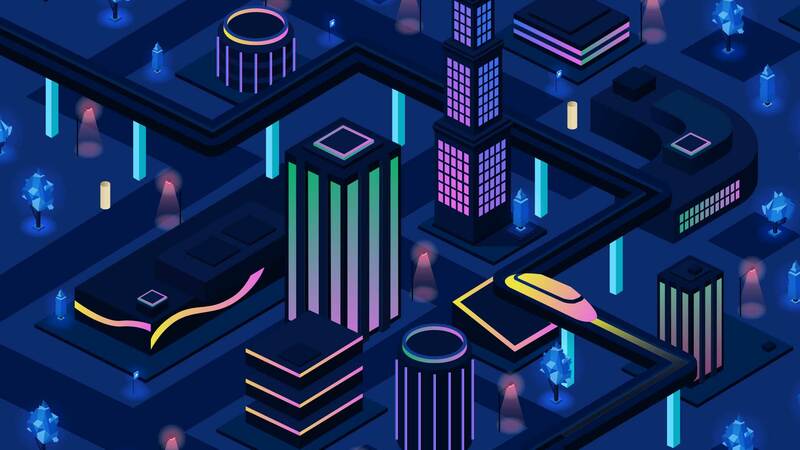 These operators expect that the events will provide customers with a taste of what the future entails with 5G — as they plan to offer new viewing experiences via AR at home and in the stadium — and, as a result, convince them that it’s necessary to their lives. While US carriers aren’t taking this approach, they should still offer customers real-world demonstrations of 5G that leverage emerging technologies that will be supercharged with the new standard. Mobile carriers should make the devices needed to support the tech more attainable. Nearly three-quarters (74%) of customers would wait until they’re eligible for an upgrade to buy a 5G-capable device, even if 5G access is available through their provider. US wireless carriers can encourage customers to make the leap to their new network technology by subsidizing 5G-enabled devices. In fact, 41% of operators are preparing to subsidize 5G-enabled smartphones, while over one-third (35%) plan to do so for 5G-enabled tablets and for AR and VR headsets.